Solo exhibition comprising of painting, sculpture, video and sound works. This featured a 5 channel video and audio installation entitled 'Rising Resistance'. This exhibition event was held simultaneously with Grandes Et Petites Machines at The Mackintosh Museum, The Glasgow School Of Art. This exhibition endeavored to dramatically highlight issues raised by various information theories and their related technologies, focusing on their contribution to ideas of progress, entropy and their social, cultural and legal impact. In particular it sought to expose the coercive role of such technologies in representations of sensationalism, secrecy and encoding in art, along with the expansion of governing institutions and patterns of detection and surveillance. An installation of paintings, sculpture and video (spanning the Mackintosh Gallery at Glasgow School of Art and Sorcha Dallas Gallery) reflected on the changing ubiquity of digital zones, where the virtual and physical coexist, whilst exploring concepts of the artist/creator/viewer as being complicit in the surveillance and division of objects. 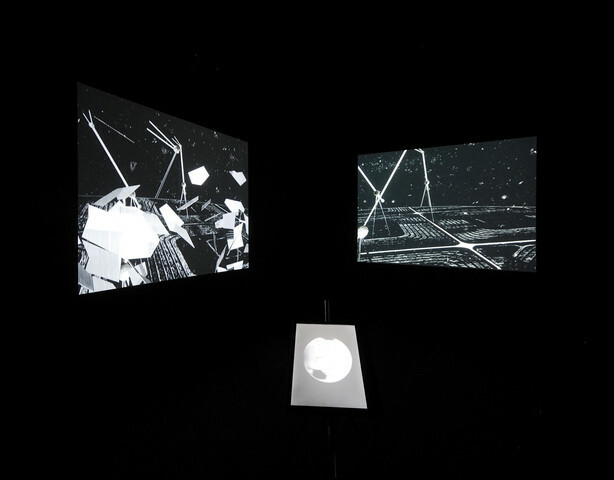 The concrete artworks in Grandes Et Petites Machines also functioned virtually as animated components in the accompanying video work Peer to Peer, screened during the exhibition period. Peer to Peer is an Artists Film and Video production supported by the Scottish Arts Council and Scottish Screen.